Apparently I’ve deemed this week strange accent post title week. And I can’t tell you when the streak will end. I’m not about to mess with momentum, that would just be silly. So get ready to hunker down. 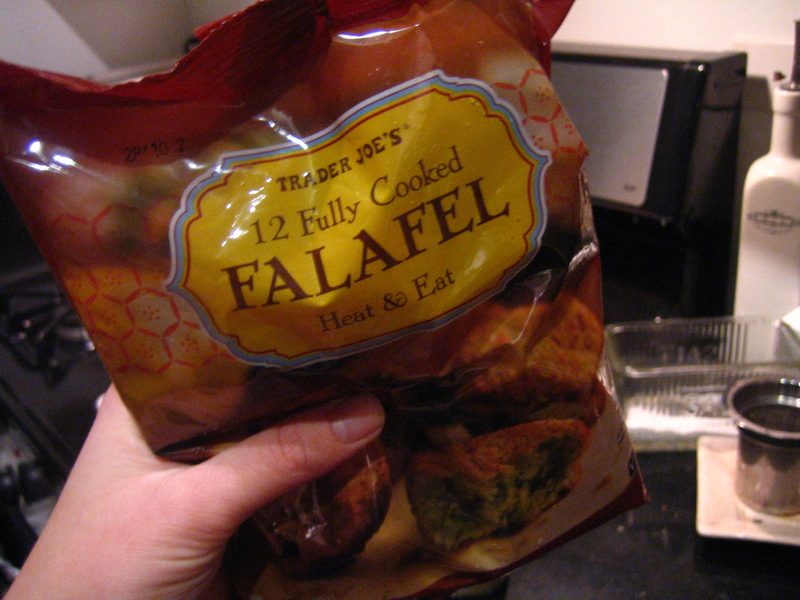 Remember when I bought frozen, ready to eat falafel balls (hehe, balls) at Trader Joe’s? Do you remember now? Ok, phew. Well, they’ve been sitting in my freezer for a few weeks because generally speaking, I’m the opposite of lazy when it comes to making dinner. Don’t get me wrong, I’m not trying to be a big braggart or anything. I’m lazy about plenty of things. Like doing laundry…or vacuuming…or cleaning the heating vents in my apartment. Gross. But making dinner from scratch I can handle. So frozen meals are generally saved for those days when I have zero time and zero energy. 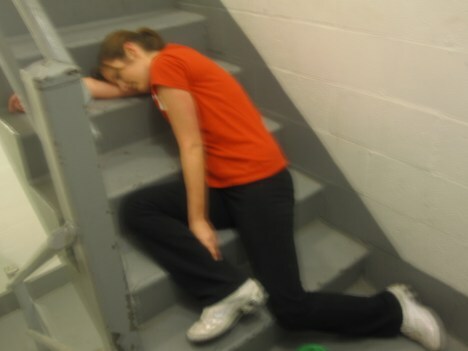 Kind of like Amy after our first training climb of 66 flights of stairs. Please forgive me for recycling that photo. It was calling to me and I felt I had no choice. I found myself in such a situation recently. I wanted to eat something substantial, yet healthful, and with minimal prep and clean up involved. 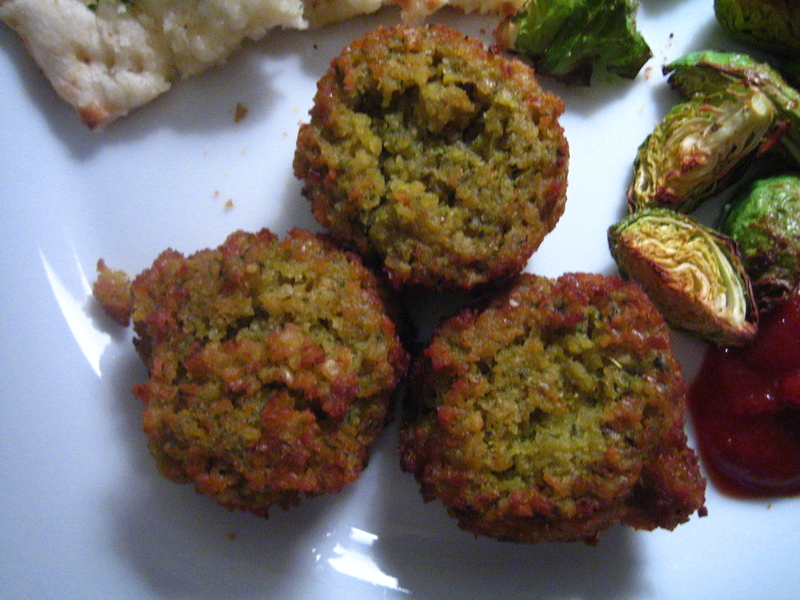 The falafels. They spoke to me. The package recommends microwaving these puppies under a damp paper towel to retain as much moisture as possible. Let me tell you, dampening that paper towel was hard. work. You could also throw these in an oven, but I can definitely understand why they recommend using the damp paper towel technique. Once they were done heating, they didn’t look dried out at all. I would’ve given my right arm for some tahini to go with these. Ok, maybe not my whole right arm. Maybe a fingernail. Maybe. But some tahini would have been nice. Roasted brussels sprouts with a squirt of ketchup. I just realized that I don’t really like the word “squirt”. Unless we’re talking about soda. Or a little kid. 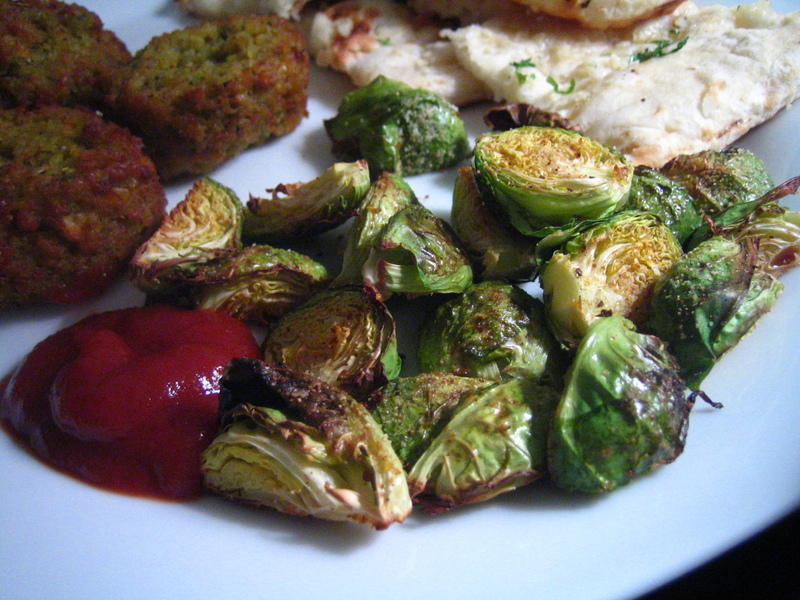 But I will say, ketchup+brussels sprouts = I think even kids would eat this. Try it! You’re welcome! 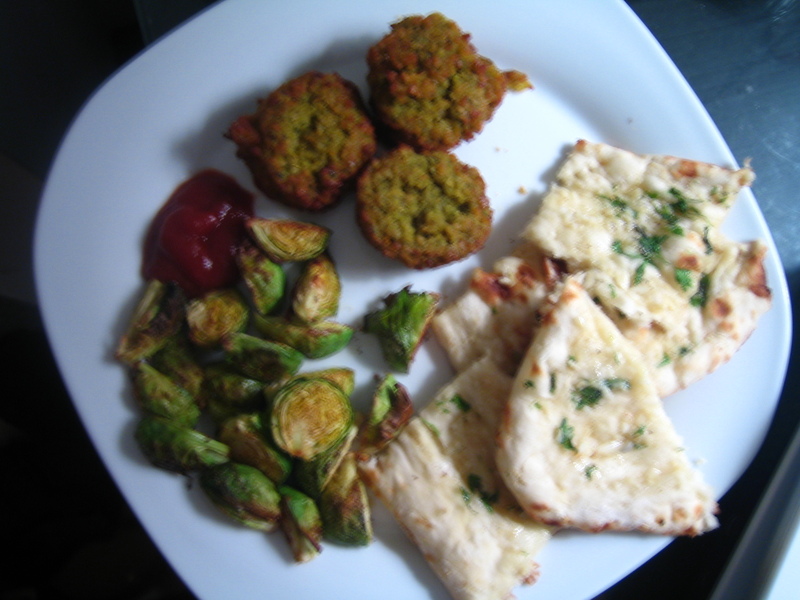 Plus a piece of garlic naan (courtesy of Trader Joe’s, naturally). 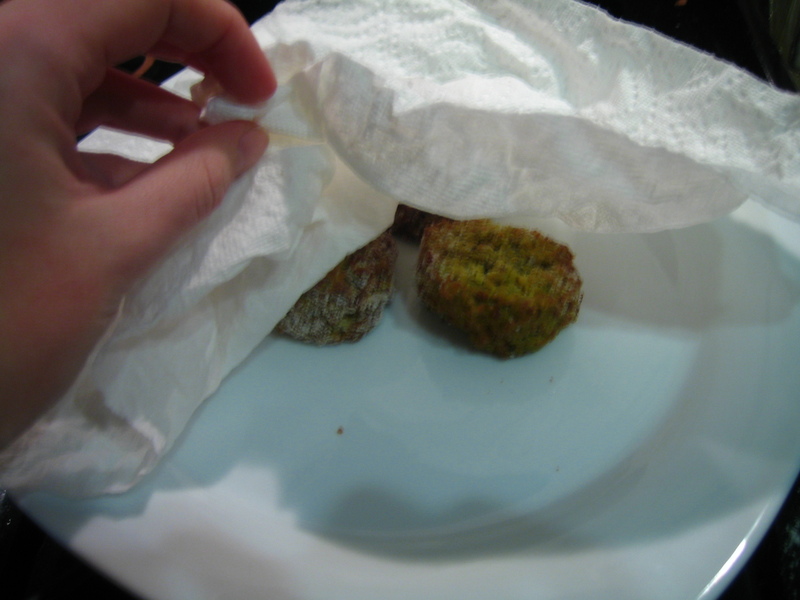 The falafel was good on it’s own and even better wrapped up in pieces of naan. Yes, I realize I’m mixing my ethnic cuisines here, but sometimes I enjoy bucking tradition. Pita would have been excellent, too, though. I will say, these falafel had a slightly more citric bite than fresh falafel I’ve had. Perhaps because it’s the recipe (did I taste lemon? ), perhaps because they add something to preserve the color or something. But regardless, it wasn’t overwhelming. The thing I forget is that falafel are amazing straight out of the fryer. I’m sorry, but if deep fried falafel are wrong I don’t want to be right. And you can tell the difference between those fresh, not-too-greasy nuggets of magic and the frozen variety. But these were pretty dang good- especially for something I heated for 60 seconds. I’d recommend them. And they’ll definitely kick your falafel craving where it counts. Are you a falafel fan? What’s your favorite sauce/topping/wrap to eat them with? I guess I’ll forgive you. Maybe. And you already know I’ve never had falafel. Sooo lame, I know. No idea why you’re friends with me. I’m lame. Bleh. It’s ok, I’ve got you covered on the falafel front. I have a restaurant in mind- I’ll take you there, have no fear. 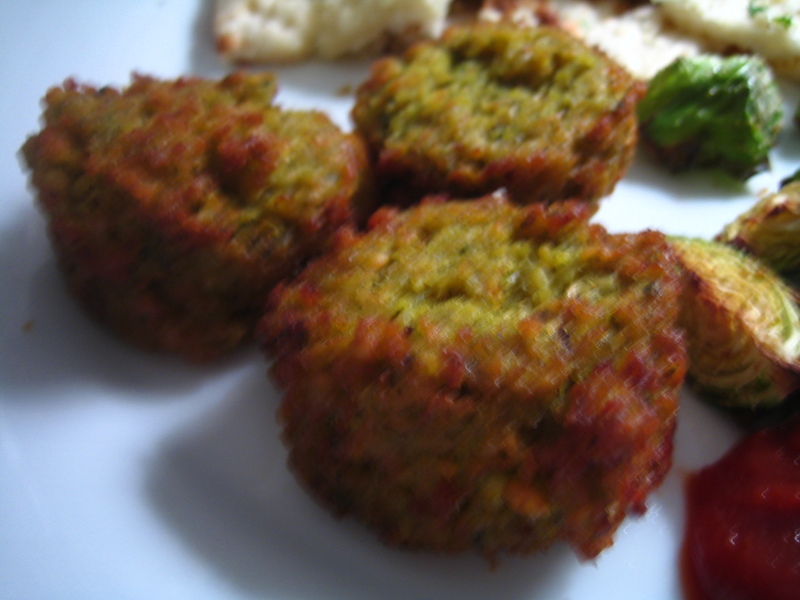 Falafel is one of my fave ethnic foods. I don’t even know if I’d call it ethnic so much anymore. But its dang tasty regardless. Brussels with ketchup, you say? I might give that one a go. I’m a mustard girl, myself.